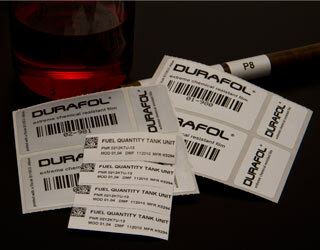 Durafol® is intended to be of particular use in applications requiring extreme chemical and mechanical resistance, including identification in the ADM industry, laboratory facilities, the chemical industry and general industrial labels where variable information, barcode traceability and extreme chemical and abrasion resistance are prerequisites. Durafol’s® superior chemical resistance allows it to be thermal transfer printed and exposed to a variety of harsh chemicals such as toluene, brake fluid, Skydrol® and acetone. Durafol® polyester is available in matt white, matt silver and matt cleares offering superior adhesion, chemical and elevated temperature resistance. due to insuffient pressure and print head energy. and an industrial thermal transfer printer.